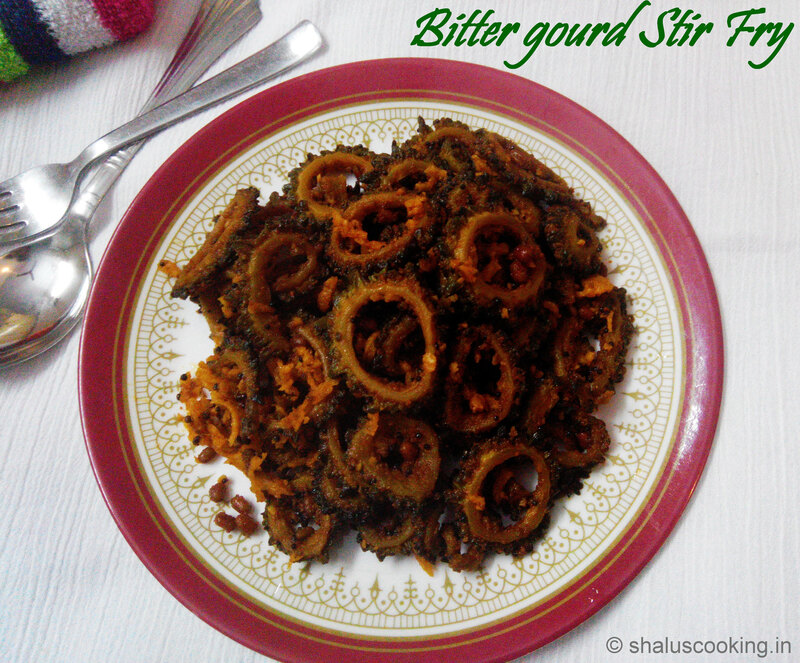 Bitter gourd Stir Fry - Karela Stir Fry, this is another bitter gourd recipe I do at home often. This is very simple recipe which does not require much ingredients to make. This dish will not be too bitter as we soak the bitter gourd in water along with salt. Also, we add tamarind extract which will reduce the bitterness little more. This will go well with any rice varieties. 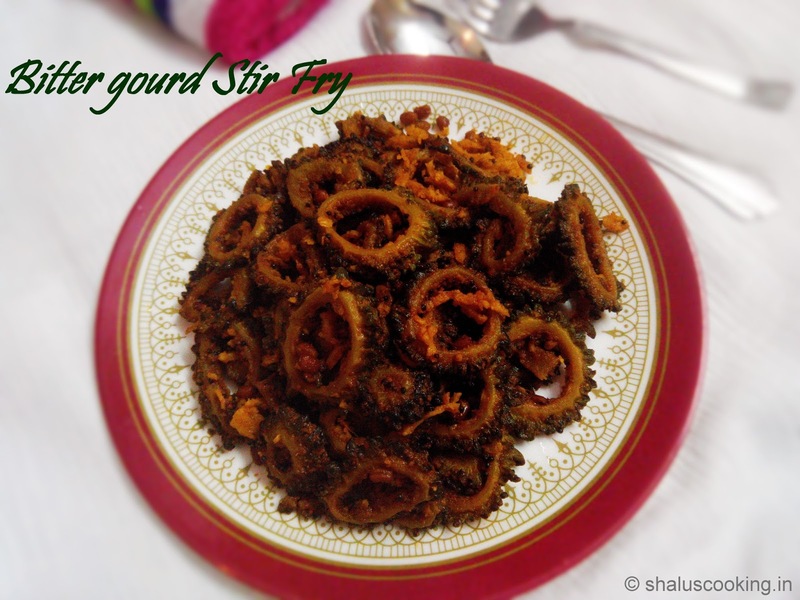 Click this link to view other Bitter Gourd Recipes. Bitter Gourd / Karela - 4 No. Sambar Powder - 2 tsp. 1. Slice the bitter gourd into circles and remove the seeds in the centre. Add some salt and mix it well. 2. Add water to soak the bitter gourd. Let it soak for about 20 minutes. After 20 minutes, drain water and squeeze the bitter gourd gently to remove the drain the water completely. 3. Heat oil in a pan, add mustard seeds and urad dal. When urad dal starts to brown, add the bitter gourd. 4. Mix well and spread the bitter gourd around the pan and cook on low flame till it becomes tender. Stir it frequently to avoid getting burnt. Once it becomes tender, add the tamarind extract. 5. Let the bitter gourd cook in the tamarind extract. Add turmeric powder and salt. Mix it well. 6. Once the bitter gourd is cooked 3/4th and the tamarind extract dries up, add the sambar powder and mix it well. 7. Now reduce the flame to low and cook till the bitter gourd is nicely fried and becomes dry. Add the grated coconut. 8. Add the coconut and mix it well. Switch off the flame when the bitter gourd is fried well. Easy and simple Bitter gourd Stir Fry - Karela Stir Fry is ready to serve.